With two weeks left in the regular season, the Pac-12 may have just two in NCAA tourney. But if Huskies make it three, credit Hopkins for a lineup change. In light of the University of Louisville’s loss this week of its 2013 national men’s basketball championship for being as crooked as a mountain switchback road, as well as the FBI’s national investigation that produced charges of bribery and fraud against four programs, the notion of what constitutes college-sports disgrace has ratcheted up. With the bar set so high, the growing prospect that the Pac-12 Conference might send only two teams to the NCAA tournament is a far more modest embarrassment. So let’s call such a potential fate a cream pie to the collective face of the self-identified Conference of Champions. Sort of like when the season opened with the arrests of three UCLA players on shoplifting charges during the Bruins’ sojourn in China, an episode that reached the attention of the White House’s Shiny Objects Dept. Neither of these bookend indignities merits a blindfold and a cigarette before seeking last words. But they do represent a decline in manners and competence of a kind that put Animal House on double-secret probation. This time of year on the sports calendar features much speculation about who’s in or out of the 68-team NCAA tournament, a pointless yet irresistible media confection that provides a living for dozens of ESPN employees. And unlike the past several years, the conversation includes the University of Washington, which you may have read is upon one of the more unexpected sports turnarounds since Bruce Jenner. Heading into a game at 6 p.m. Thursday (Pac-12 Networks) at Stanford (8-6, 14-13), the Huskies are 8-6 and 18-9, marks no one saw coming after the debacle that was Lorenzo Romar’s final year as UW coach. It’s the first of the final four regular-season games (also Cal Saturday followed by a pair of home games against the Oregon schools). The conventional wisdom is that winning three puts UW on the bubble for selection to the Big Dance, and fewer makes them bound for the NIT — pending, of course, an upset or two in the Pac-12 tourney in Las Vegas. For sure, the Huskies are in a pallid lump with nearly a half-dozen Pac-12 schools not named Arizona, the conference’s only ranked team in the Associated Press poll (14th, at 11-3 and 21-6). At 19-7, Arizona State is seen at the moment as the second conference NCAA entrant, then it’s anyone’s guess as to whether Washington, UCLA (19-8), USC (19-9), Utah (17-9) or perhaps Oregon (17-10) will ooze into the tourney in the manner of a transmission-fluid leak on the pavement under your car. The problem the conference has established is that since these pretenders are in the same mediocre conference playing one another, any win aside from an upset of the Wildcats is, well . . . meh. In the final two weeks, it’s hard for any team to improve its resume, but really easy to further mess it up with a missed free throw here and there. That’s why the selection of only two tourney teams from the conference is plausible. As fans of the tourney know, getting two teams in is something within the reach of Recreation League sponsored by Radio Shack, as well as Local 32 Plumbers Pipe Fitters Refrigeration & HVAC Union Lunchtime Hoops Conference. So the Pac-12 is teetering on the verge of even more mockery than that endured by its football brethren, none of whom were in the conversation for the four-team College Football Playoff. Mockery is, of course, a mild punishment compared to felony arrests and a national-title vacation. But it is getting to be a sub-theme in the major jock citadels of the West Coast. None of this is of apparent concern to Huskies coach Mike Hopkins, whose first year at Washington could not be going better if it included Reese’s-flavored ice cream. If ever there was a more propitious time for a rookie head coach to show up in a mediocre league, I am unaware of it. And his team has already beaten Arizona. Not only was the 78-75 win Feb. 3 a season-maker, the final play had a consequence completely overlooked in the celebration of Dominic Green’s buzzer-beating trey that won the game. The moment was set up by a driving shot in the lane from freshman guard Jaylen Nowell that was blocked so hard by UA’s splendid 7-1 center, Deandre Ayton, that the ball nearly broke apart before bouncing into Green’s hands more than 20 feet away. What the block represented was an over-reliance on Nowell, the only member of Romar’s heralded five-man recruiting class who stayed with UW after the coaching change. He deserves props for staying, and he’s the team’s leading scorer for good reason. But he’s a freshman. He leads the team with 47 turnovers, 14 more than No. 2, point guard David Crisp, and is shooting 44 percent from the field. As is often the case with talented freshmen thrust into big responsibility, too often he tries too hard. 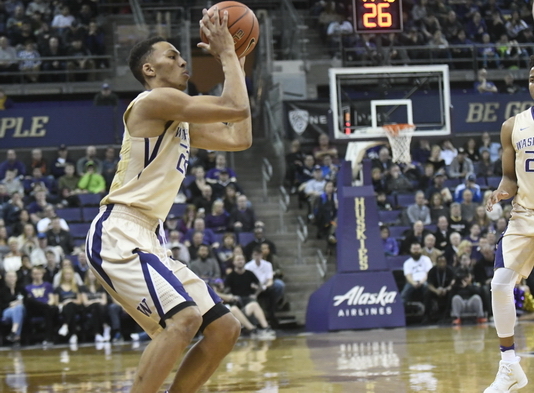 After the big win, the Huskies lost three in a row before rebounding Saturday with a win over Colorado, 82-59. Unannounced before the game, Hopkins benched Nowell in favor of Green, a junior with a more lethal outside shot. The change wasn’t the only, or even the main, reason Washington won decisively. But it helped. Meeting reporters Tuesday, Hopkins said he hadn’t decided the starting lineup Thursday, but he did drop a clue big enough to be seen by the unaided eye. Referring to his often double-teamed big man in the post, Noah Dickerson, Hopkins said, “Noah should buy Dominic a Rolex watch, like how offensive linemen have been given things by the quarterback. The change may or may not be a big thing. But in a season in which much is muddled by mediocrity, small things loom large. Make a note of the change now, Huskies fans, and if the UW becomes the third team in the NCAA tourney, send the note to Hopkins, with thanks. And cc it to conference commissioner Larry Scott, so he’ll know why the cream pie missed. Art, once again, a great read, lots of truth and lots of laughs combined. cheers! Hopkins should be the PAC-12 Coach of the Year, whether the Huskies make the NCAAs or not. And it’s his first year as a head coach! Nice hire, UW! The Dawgs might get into the race to the national championship, only to get thwarted in the first round. I hope they do well.Now the ‘other’ Dawgs (Bulldogs that is) – namely Gonzaga – played a tight game tonight at San Diego. They could go deep into March. I don’t see much about the Zags, Art. Why not? They are pretty good. And sadly, they didn’t even show up against Stanford.